Transitional cell carcinoma (TCC) is a cancerous tumor most commonly found in the urinary bladder and the urethra. It is most often seen in older small breed dogs such as Scottish terriers, West Highland white terriers, dachshunds, and Shetland sheepdogs and rarely identified in cats. There appears be a genetic component to the development of TCC, especially in Scottish terriers. Rare cases have been linked with the use of cyclophosphamide (a chemotherapy drug) and chronic exposure to hydrocarbons. Many times a cause is not determined. These symptoms are not specific for a bladder tumor. Animals with bladder infections or bladder stones may behave the same way. 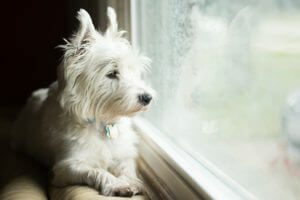 A bladder tumor or bladder stones may be suspected in animals with these symptoms if they have only temporary relief or no relief from antibiotic therapy. It is rare that a bladder tumor can be felt by palpating the belly, and most bladder tumors are not seen on abdominal radiographs (X-rays). Some tests your veterinarian may recommend if a bladder tumor is suspected include urinalysis (microscopic examination of a urine sample), ultrasound of the abdomen, biopsy to confirm the diagnosis if a mass is found within the bladder, and radiographs of the chest to check for potential spread of the tumor to the lung. 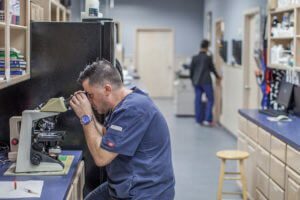 Additionally, a urine culture with blood work helps to assess the overall health of the pet to help determine what treatment options could be offered. Surgery may be a treatment option for cats with TCC, because the tumor tends to involve a part of the bladder that is not essential for bladder control. Surgery is often not a good treatment option for TCC in dogs because the tumor is often located in the neck of the urinary bladder. Surgery in this site may render the dog incontinent (unable to control urination); plus the surgery is rarely curative. However, if your pet cannot pass urine because they are obstructed by the tumor, a procedure called a urethral stent may be an option. The advantages of a urethral stent are that they can be placed with fluoroscopy (a moving X-ray); they allow animals to pass urine; and they are relatively easy to place. The disadvantages are recurrent urinary tract infections and a small chance of incontinence. Animals with urethral stents need to have their urine cultured on a regular basis. Drug therapy is the most common treatment for TCC. Up to 40% of dogs with TCC may have a response to medical therapy, although that response is almost always partial. Although not all tumors shrink in response to therapy, another positive response is a decrease in the growth rate of the tumor. Medications that may have some effect against TCC in dogs or cats include piroxicam, mitoxantrone, carboplatin and doxorubicin. Piroxicam is an anti-inflammatory drug that also has anticancer activities. Its main side effects include loss of appetite, kidney dysfunction, and vomiting secondary to stomach irritation. These side effects may be minimized by giving the medication with food. If you notice that your pet develops diminished appetite, vomiting or a change in the consistency of their stool while on piroxicam, the medication should be discontinued and your veterinarian should be contacted immediately. Mitoxantrone, carboplatin and doxorubicin are more traditional chemotherapy drugs. The two equally important goals of chemotherapy are to control the tumor for as long as possible and maintain a good to excellent quality of life throughout the duration of treatment. Occasionally, radiation therapy may be recommended to help relieve some of the clinical signs associated with the tumor. Used in this manner, there should be minimal to no side effects of the radiation. Your veterinary oncologist will help determine the best treatment option for your pet. Ultimately, TCC is a fatal disease. The tumor will most frequently grow to obstruct either the urethra or the ureters, which can result in kidney failure due to obstruction. There is also the potential for metastasis (tumor spread to a distant site). With treatment, average survival times following diagnosis are between six and nine months. 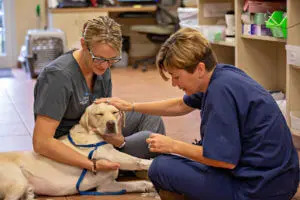 However, the quality of life for many pets being treated for TCC is good, and your pet should be happy and comfortable during their treatments.